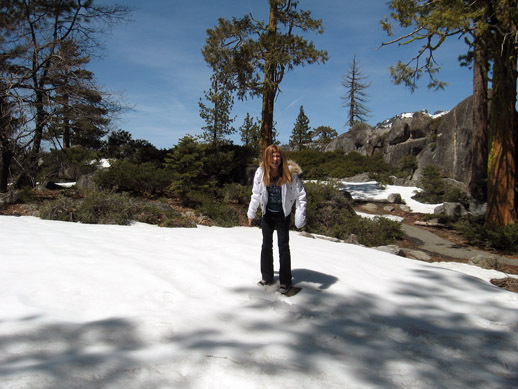 Jessica and I decided to make a road trip up Sonora pass to see some of the remaining snow. What a beautiful day! It was in the middle sixties with little to no wind. We drove first to Dodge Ridge ski resort to watch the spring skiers getting very wet. With the higher temps the snow was very wet. Jessica and I spent some time playing in the snow and then had lunch outside the lodge. We continued up the mountain past Strawberry and almost to the top where Sonora pass is still closed due to the snow. We got out and did a little hiking around where the snow wasn’t too deep. The snow on the sides of the road and some drifts in the shade were still very deep but the road conditions were exceptional. This was only the second time Jess has seen snow. And as a native Californian she was very excited to roll around and play in it. Since I’ve seen my share of it, if I never see it again it wouldn’t be a loss. But she had a great time and it was fun being there with her watching her enjoy herself. On the way back we stopped at Jamestown and visited the Rail Museum (Rail Town 1897? State Park) and walked around the town and the shops. We returned to Modesto after a stop at the car wash. Completing another Father daughter adventure. Some great photos from the race Marathon des Sables starting near Morocco in the Sahara. Read this article. This is just typical of unknowledgeable middle management in a big box retail organization. I wish I could say I haven’t seen this before but it’s more typical than you’d believe. It also explains why a lot of big box stores no longer can make it. The best commissioned sale people are being let go. Remember Circuit City. I feel for the women.